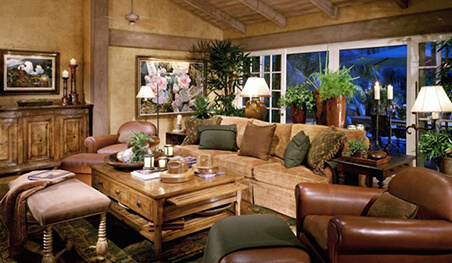 Barbara Lee Grigsby Design & Associates, Inc. Your home is your sanctuary, the environment where you welcome the people most important to you, a reflection of your personality and style. With our decades of experience designing fine furniture, rugs, cabinetry, window treatments, and every element of home interiors to the finest detail including turn-key, Barbara Lee Grigsby Design Associates works with the most discerning clients to create comfortable, approachable, and beautiful interiors. To orchestrate and create a home that is in perfect harmony, a designer needs to ensure both scale and proportion have been accomplished. Scale is about size; proportion is all about balance. 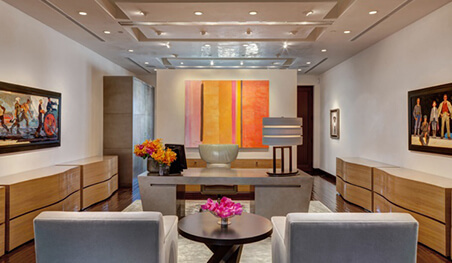 The interior designer plays as critical a role as the architect in creating a functional, pleasing flow to the home. Since there are no set guidelines, experience is the key, and it has taught me that when each room has been carefully addressed, challenges resolved, and discrepancies manipulated, the end results can be stunning and incredibly rewarding. Color is a powerful element. It can be serious or playful, and it has a key role in setting a mood and creating an environment. It strongly influences how we highlight our objects of art, furnishings, and or antiques. It helps us expand or contract spaces, simply by using the appropriate colors. Both natural and artificial light greatly influence how we perceive color. Many aspects should be considered throughout the selection process for both color and light. 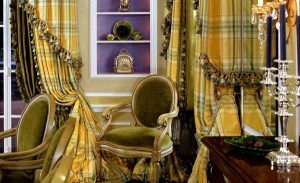 Some of my main considerations are determined by the geographic location, sun exposure of the space, fabrics and furnishings, and color palettes already in place. The most important factors to be considered when selecting color and light are those that will complement and flatter my clients. I always want to keep in mind the importance of function and use as much natural light as possible, bringing the outside in to create that sense of well-being we all strive for. It is important to maintain an elegant balance between aesthetics and sensibility. I strive for a graceful collaboration between the two. Harmony is balancing all the various components and design elements—space, scale, function, color, light, texture, etc. When you take all of the décor elements and make them work together instead of competing against one another, you begin to orchestrate harmony. Balancing your patterns and textures, soft and hard surfaces, contrasting lights from darks, you begin to blend together all the layers of a design that are uniquely individual to the client. Harmony and balance are immediately sensed, felt, and unspoken. Great design should never call attention to itself—it should exist subtly if executed correctly. 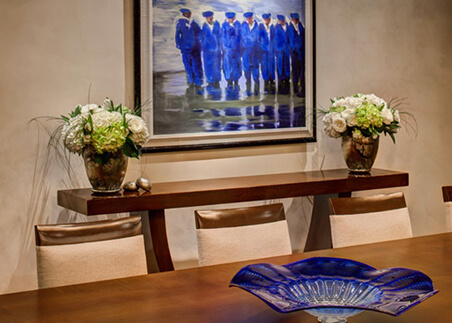 When I design interiors, I tailor the experience to every client’s preferred level of involvement. I’m here to listen, to solve problems, and most importantly to create a home that reflects who you are. Our experience working together will be easy, exciting, and memorable. It’s my job to remove the stress and make the journey wondrous, rewarding, and utterly personal. Please give me a call today for a consultation, or fill out this simple form to get more information about our design services. © 2016 Barbara Lee Grigsby Design Associates, Inc., all rights reserved.